Advances in genomic and proteomic profiling of disease have transformed the field of molecular diagnostics, thus leading the way for a major revolution in clinical practice. While the range of tests for disease detection and staging is rapidly expanding, many physicians lack the knowledge required to determine which tests to order and how to interpret results. 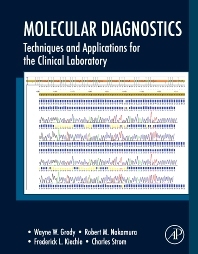 Molecular Diagnostics provides a complete guide to the use and interpretation of molecular testing in the clinical arena. No other available resource offers this emphasis, comprehensive scope, and practical utility in the clinical setting. Pathologists, laboratory technicians, geneticists, physicians, medical students, and other health care professionals involved in molecular testing. Identification through DNA analysis in criminal and family relatedness investigations. Wayne W. Grody, M.D., Ph.D. is a Professor in the Departments of Pathology & Laboratory Medicine, Pediatrics, and Human Genetics at the UCLA School of Medicine. He is the director of the Diagnostic Molecular Pathology Laboratory within the UCLA Medical Center, and is also an attending physician in the Department of Pediatrics, specializing in the care of patients with or at risk for genetic disorders. He has been one of the primary developers of quality assurance and ethical guidelines for DNA-based genetic testing for a number of governmental and professional agencies including the FDA, AMA, CAP, ACMG, ASHG, NCCLS, CDC, NIH-DOE Human Genome Project (ELSI program), and PSRGN. He served as a member of the NIH-DOE Task Force on Genetic Testing, and was the working group chair for development of national guidelines for cystic fibrosis and factor V-Leiden mutation screening. Most recently, he was appointed chair of an Advisory Committee on Genomic Medicine for the entire VA healthcare system. He did his undergraduate work at Johns Hopkins University, received his M.D. and Ph.D. at Baylor College of Medicine, and completed residency and fellowship training at UCLA. He is double board-certified by the American Board of Pathology (Anatomic and Clinical Pathology, Molecular Genetic Pathology) and the American Board of Medical Genetics (Clinical Genetics, Molecular Genetics, and Biochemical Genetics). Scripps Clinic, La Jolla, CA, U.S.A.
Medical Director, Genetic Testing Center Nichols Institute, Quest Diagnostics, San Juan Capistrano, CA, U.S.A.